The Biebs collaborates a lot, I am not going to say it is because he can't hold down a song on his own - but that may be what I am implying if you get my drift. Bieber's new album drops soon and you are going to hear a string of rappers and R and B artists singing along with young Justin (you know...all the people he wishes he could be and acts like his is). But then he occasionally does a collab with someone more on the same level as himself, such as Carly Rae Jepsen, his Canadian protege. 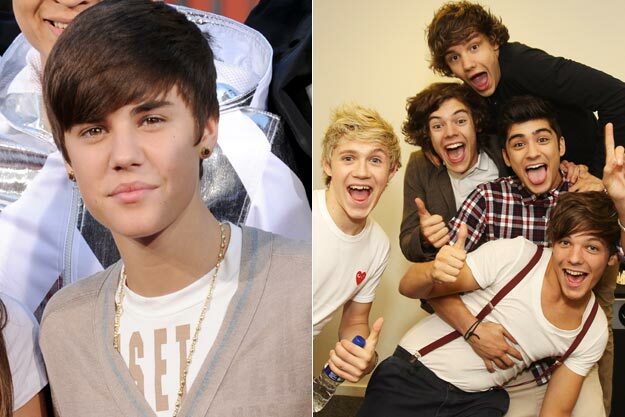 Now we are hearing that the Biebs may be doing the adult population of the world an enormous foul by collaborating with the other tween sensations, One Direction. Can you imagine? If this actually happens and ever gets played out on stage you can bet your grandma's dentures that a riot the size of Vancouver's embarrassment and the Egyptian revolution combined will play out. They will need to get an entire city for of officers out to manage that madness. Tweens will die, that's all I'm sayin.